Hydroponics is the science of growing plants without soil. In hydroponic gardening, plants grow in a water medium infused with the macro and micronutrients they need to thrive. 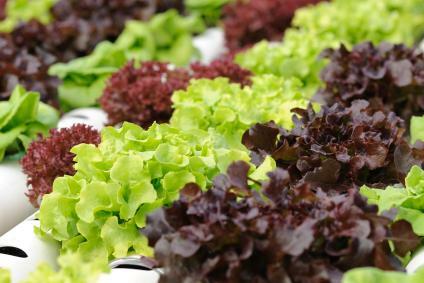 Once thought the purview of science fiction, hydroponic gardening has gained renewed interest as gardeners seek to grow vegetables indoors to ensure a steady supply of organic produce year-round. Anyone can start a hydroponic garden. You don't even need to purchase fancy equipment. You can use recycled materials to start a hydroponic garden. Hydroponic gardens grow plants in water mixed with nutrient solution rather than soil. You'll need a waterproof container such as an old plastic bucket with a lid. Master Gardener Marcy Stanton suggests using an old Styrofoam container such as the kind fish stores use to transport and sell their stock. Many will give away the cartons free, but you'll need to let them air out for a while to get rid of the fishy smell! A better choice may be the frosting canisters used by commercial bakeries. These are large plastic buckets or tubs holding a gallon or more of commercial cake frosting or batter. Many restaurants, bakeries and other food service companies throw them out when they are empty. Ask if you can have any they are discarding. Wash them with soap and water and rinse thoroughly, then let them air dry before using. You will need a good lighting system and a timer for your hydroponic garden. A fluorescent light fixture purchased at the hardware store that can hold two tube light bulbs supplies plenty of light for your hydroponic garden. Add a timer to the system so the lights go on and off automatically. Plain old tap water is fine for your hydroponic garden. For plant food, purchase a liquid 15-15-15 fertilizer or a 15-20-15 fertilizer. Wait until the plants have roots to add fertilizer to the soil. You can grow many vegetables indoors, but most people enjoy growing lettuce and other green, leafy vegetables indoors during the winter months. You'll need a mesh bag and some seed starting medium as well as a package or two of your favorite seeds. Add the seed starting medium to the bag, suspend it in your plastic container, and add seeds. Once the seeds develop roots, add the water and fertilizer mixture to the container. Aerating the water and nutrient mixture in the hydroponic system helps plants thrive as well as prevents algae and bacteria from growing in the water. A simple fish tank pump set on a second timer that aerates the water each day works fine. You can buy a fish tank pump at a pet store or even find them secondhand at thrift shops or garage sales. Place your hydroponic system in an area of the house where it won't be disturbed by curious children or pets. It's especially important in households with pets to place a lid on the water container so curious pets don't drink the fertilizer-infused water; prevent poisoning accidents and call your veterinarian immediately if you suspect your pet has sipped the hydroponic solution! Lettuce and greens like cool temperatures of 50 to 70 degrees, so a basement, garage or similar area is ideal. Place the water containers on a table and hang your light fixture over the table. Add the fish tank pump to the container. Place timers on the lights and the pump. Cut holes about 5/8 of an inch in the lids of your containers. You'll suspend the net with the seed starting medium through the holes and eventually, as the seeds sprout, this is where your plants will be suspended. You can make a net from an old string bag such as the kind used to hold onions or tulips in the fall. Fall bulb bags are ideal because the holes in the netting are smaller. Add water to your containers. As the roots develop, add the fertilizer solution. Check the water level weekly to ensure adequate water reaches the roots of the plants. Tomatoes, peppers and other heat-loving vegetables should be placed in a warmer environment. These take a longer time to grown and need more space. As they grow taller, you may need to increase the distance between the light fixture and the tabletop, so be ready to move or raise the fixture. Hydroponic gardens may someday produce food for apartment dwellers, urbanites and people with contaminated soil. Hydroponic experiments make great science fair projects for children, especially if you use clear growing containers so the children can watch the plant's roots develop. Someday, outposts in space may use hydroponic gardening techniques to grow fresh food for astronauts, explorers and colonists. If you think that's science fiction, consider that just 30 years ago, many people would have thought the Internet was science fiction, too! Experiment and have fun with hydroponic gardening. It's another great way to add fresh vegetables to your table in the middle of winter.